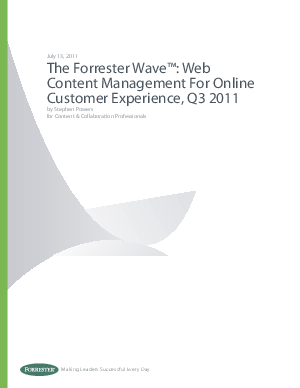 The web content management (WCM) market is in transition. Functionality to enable publishing to the Web - whether internally or externally - has become commoditized. Yet now, the WCM market is growing based on customer experience management (CXM) needs, including multichannel delivery, content targeting, analytics, and integration with other CXM technologies. Forrester evaluated 10 WCM products across approximately 115 criteria and found that they have a lower level of maturity when viewed against these capabilities. SDL and Adobe lead due to their rich functionality, strategy, and enterprise track record. Read on to learn about the best in class CXM products.